"He's dying to become a chef." Ratatouille is a animated film about a rat named Remy that dreams of one day becoming a great chef in one of the best restaurants in Paris. Remy's family including his father and brother don't understand his desire to create great tasting food instead of just eating the garbage that rats normally eat. In a search of saffron, Remy and his brother enter a house only to be discovered by the little old lady that lives there so all the rats flee the home before the little old lady shoots them with her shotgun. While fleeing Remy is separated from his family and floats through the underground pipes of a city. 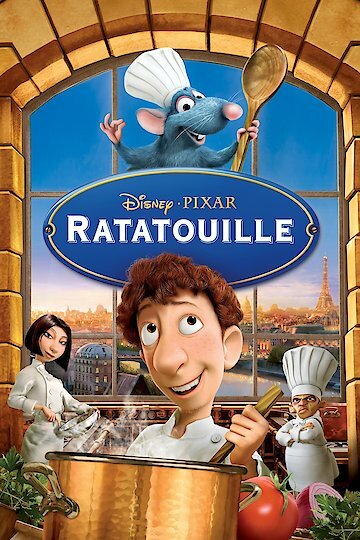 When Remy comes up to the city, he merrily discovers that he is in Paris by one of the restaurants where he has always dreamed of being a chef. So he does what any great chef would do and enters the kitchen only to find a soup being made by the long lost son of the chef he has idolized. Unfortunately the son, named Linguini didn't inherit his father's skills for cooking so when no one is looking Remy adds this and that to the soup to make it wonderful. After the other chefs discover that Linguini has made a great tasting soup, he is asked to recreate that soup if he desires to work at the restaurant. Suddenly someone discovers Remy, the rat and all the chefs race to kill the rat. Linguini manages to catch Remy and convinces the head chef to not kill the rat in the kitchen. So Linguini takes Remy to throw him in a river but once at the river Linguini doesn't have the heart to do it. Then Linguini discovers that Remy can talk and that he was the one that created the wonderful soup. The two of them devise a crazy scheme for Remy to help Linguini recreate the soup so that he can keep his job at the restaurant and Remy can live his dream of being a great chef at the greatest restaurant in Paris. Remy is able to control Linguini by sitting under Linquini's chef hat and pulling his hair to communicate to Linguini what ingredients need to go into the recipe that Remy wants to create. The two of them face many challenges such as the State Health Inspector who discovers Remy and threatens to close the restaurant down. But in the end Remy is able to live his dream of being a great chef. Ratatouille is currently available to watch and stream, buy on demand at Amazon, Vudu, Google Play, FandangoNow, iTunes, YouTube VOD online. After the horror of the Boston Marathon bombing, comedian Patton Oswalt leaves us with a message that speaks to many of us, and reminds us that "the good outnumber" the evil.